Welcome to my Girly Afghan CAL Mandala Part 3. Onto part 3, this is a fun section to add some flowers and clouds. Girly Afghan CAL Mandala Part 3 Pattern.. Note: Pull Rnd 12 stems through the ch4 spaces to the front. Note: Pull Rnd 14 stems through the ch4 spaces to the front. 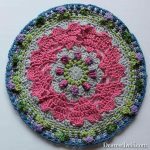 Girly Afghan CAL Mandala Part 3 Video Tutorial..